4. Planting edibles with, and to be potentially harvested by, students. 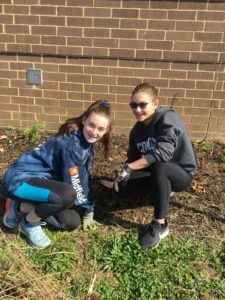 Kenmore’s 2019 Garden Day, April 6, was a huge success! 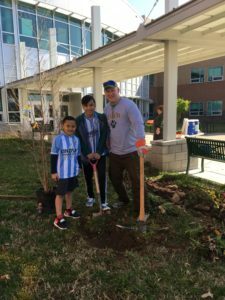 We increased our campus tree canopy by planting 5 river birch trees. Two blueberry bushes were planted and the entrance gardens were extended. In the Sensory Garden, we planted lamb’s ear (touch), lavender (smell), sugar plant, oregano & thyme (taste). We planted native plants who attract native insects who will attract native birds who will sing and engage our senses of hearing! 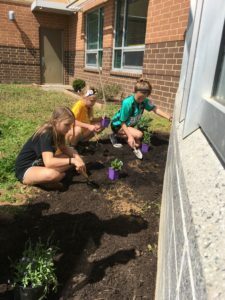 Mr. Wilson worked with a team of helpers to beautify the Art Garden in the back. Thanks to MOMs for not only supplying healthy snacks, but for also sending two volunteers to help us! Much gratitude to all who participated. 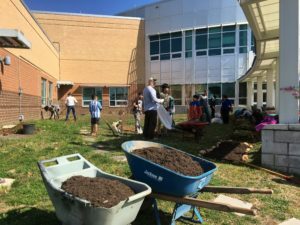 We not only made KMS grounds better, we helped Arlington’s eco-goals to get steps closer a Natureopolis (healthy, nature-rich city)!